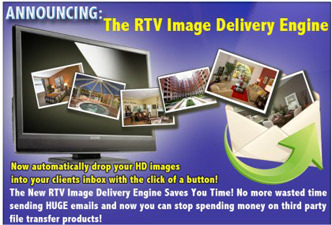 RTV launches new Image Delivery Engine allowing RTV virtual tour providers a quick and simple way to deliver high resolution images directly to their customer base. The Image Delivery Engine is as simple as pushing a button in the virtual tour manager system and emailing a link to the customer. The new Image Delivery Engine has been programmed to work with both the HD V-Slides and HD V-Tours so all RTV customers may take advantage of the latest developments. Most RTV virtual tour providers delivering several tours daily to their customers will instantly see several hours of time gained back on a monthly basis. All RTV providers are encouraged to login and test drive the new technology today. As always please call us for any questions that you may have.